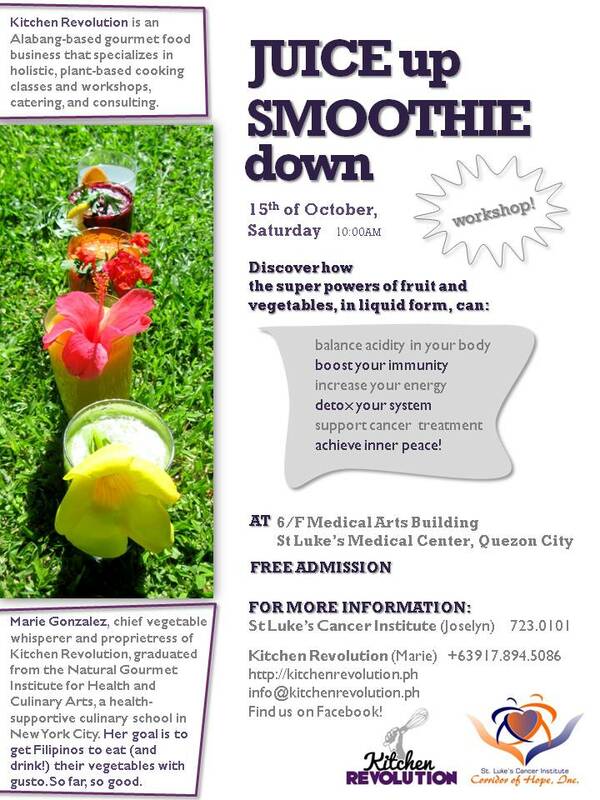 I wanted to share that I will be conducting a green juice and smoothie workshop this Saturday morning (the 15th) at St Luke’s Medical Center, Quezon City. Check out the poster at the end of this post for more details. Ooh, did I mention that it’s F-R-E-E? I held a workshop similar to this last June in Alabang and it went really well. Researching for the class has convinced me more than ever that the solution to life’s problems, tears, sicknesses, and hangovers is green juice and smoothies. True story, yo. This workshop is sponsored by Corridor of Hope, the cancer support group of St Luke’s Cancer Institute (Multiply page here, Facebook page here) and headed by Ryan Fernandez, a friend of mine who’s as smashing a food photographer and writer as he is CoH’s president. Ryan himself is a survivor of Hodgkin’s lymphoma – which he was diagnosed with at 22 (!!) – and supplemented his cancer treatment with the love of green juice. I hear he still drinks a glass of green juice daily which, quite frankly, floors me. Anyway, sign up and learn how to love to drink your veggies!